The Friday 56 is a meme hosted by Freda at Freda's Voice. 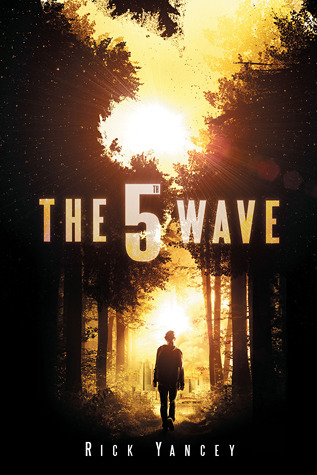 My Friday 56 for this week comes from one of my Christmas gifts - The 5th Wave by Rick Yancy. I'm really liking this book so far. From page 56 -- "The camp lay twenty miles east of where we lived, hacked out of the woods during the 3rd Wave to build a field hospital after the ones in town had reached full capacity. The buildings were slapped together, made out of hand-sawed lumber and salvaged tin, one main ward for the infected and a smaller shack for the two doctors who tended the dying before they, too, were sucked down by the Red Tsunami." I keep meaning to pick this book up, but life keeps getting in the way. It has a habit of doing that. Thanks for stopping by! I did this one a while back, and I STILL haven't read it, and it comes out this month! OH well I'll get to it ASAP! I'm enjoying it so far. Thanks for stopping by! I really want to read this book! It sounds great. Thanks for stopping by! I'll be sure to check our your post. Sounds like a chilling sci-fi story. It may be too scary for me! Other than suspense, it's really not that scary so far. Thanks for stopping by! I love this book! Cassie is one of my favorite protagonist. Hope you enjoy and have a good weekend! Yeah, I'm enjoying her. Thanks for stopping by. This is a series I've wanted to read for like forever... lol. There are so many great series out there that sometimes it's hard to get to them. I got this book as a paperback ARC and *still* haven't read it. But I saw the movie preview when we took the kids to see Star Wars and I thought, 'hmm, I think I better get that one read.' ;) I'm glad you're enjoying it, Carey! It's definitely good. I'm wondering how it's going to end. This was a great book and I can't wait for the movie. It is pretty good. Thanks for returning the visit. OMG!!! I have this one on my pile for next week in anticipation of seeing the movie. Talk about a tease this week. I hope you are enjoying it! Thanks so much for sharing. The timing wasn't on purpose either. It was just the first Christmas book I started reading. Thanks for stopping by!